Cost Breakdown Library is used to record details with the breakdown items you want to use in preparing your quotes. 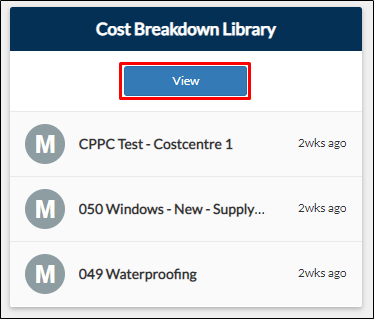 From your project page, go to Pre Construction > View on Cost Breakdown Library tile. Type Cost Breakdown Library on the search bar located on the upper right corner of your portal. 2. You will be directed on the Cost Breakdown Library page. 4. Update the details of your breakdown. Click the + button under the Action column to add another item. 5. Click Save to apply changes.